I recently took a 2017 and 2018 Kia Sorento out for a test drive. When I put the passenger side FRONT WINDOW DOWN I experienced a very loud and painful vibration (I don't have what to call it) at highway speeds. I have experienced this vibration noise in almost every car I'm owned when one REAR WINDOW is the only one lowered but NEVER when a front window is the only one lowered. It was So bad that it was literally painful on my ears. Since this happened on two different Sorentos, I have to think it's a common problem but can't find anything about it online. 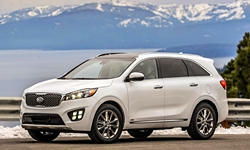 Have any Sorento owners experienced this? As an FYI, I looked at 2 2016 Sorentos at a dealership a few weeks ago and I thought it was odd that they both had rain guards. Now I wonder if the vibration want the reason. Are you sure it isn't wind buffeting? It happens on pretty much every car that has some aerodynamic efficiency. Modern cars are much more aerodynamic than they used to be. Automakers try to guide the wind around the lines of the car. This means that wind is passing by your closed windows. When you open one, air rushes inside and creates the noise you are talking about. It sounds like a helicopter, but it kills your ears. Whenever I want the driver's window down while driving, I also open the front passenger window to balance the buffeting. It is more bearable that way. Or you could turn off the air refresher.